Sheikh Mohammed moseyed over to the Fasig-Tipton auction grounds for the first time on Saturday. He was surrounded by entourage, but acted mono-majestically. Someone had to tell him what rain was. Being from the desert, horse racing’s man of the most means witnesses a downpour only now and then and rarely a deluge like Saratoga received yesterday. Nevertheless, he loves horses and has money and that’s all that counts now. 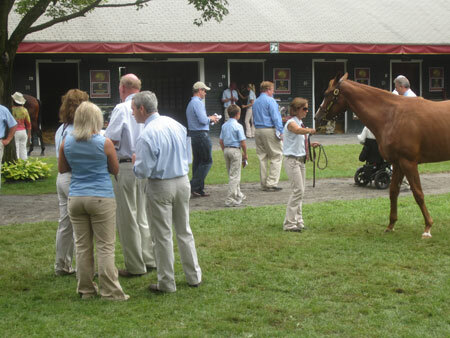 Caption: Buyers flood Fasig-Tipton auction grounds to inspect yearling after the rains came. The curtain will rise at 7 pm Monday for the first of two evenings of yearling sales. Sellers are cautiously optimistic about their prospects. There’s a fine book of blue-blooded horses assembled for purchase. The newly-remodeled Humphrey S. Finney Pavilion looks like a Rolls Royce showroom. It should, as a matter of fact, because those are Rolls Royces that buyers will be buying. The humidity rose to unbearable heights this morning. But there was relief that the rain had stopped. The sun peaked out, went away and then re-appeared. Water fell from above for eight hours yesterday, starting after the Whitney was history. Both the main track and Oklahoma were muck for the morning workouts. Jersey Town, the fine graded stakes sprinter, stood like a statue for nearly 20 minutes before accepting his exercise. Barclay Tagg stepped into the mud as if it was clover to pet him. “He’s a great horse,” the old trainer said. If nothing else, Saratoga in summer is a contrast in lifestyles. While rich folks were dining at Chianti last night, the less economically settled were drinking beer and dancing in puddles in Siro’s backyard. Professional lovebirds have descended on town to satisfy urges that thoroughbreds can’t. Hangovers kept the crowd down for racing today. As has been the case on most days, the crowd was treated to several terrific on-track performances. All turf races were moved to the main track and a bias towards speed became evident. The lowest numbered horse you could bet on in the first race was eight. In the field of seven runners, five – numbered 12 through 16 - came off the also eligible list. Buffum won for Godolphin. The stable has now triumphed at Saratoga with 25 of its 75 starters in the last five years. The New York-Bred filly Funky Munky Mama heard Tom Durkin speak her name out at least four times en route to a seventh race victory. Two important sprints – the gr. 2 Honorable Miss Stakes and the gr. 1 Alfred G. Vanderbilt Stakes - wound things up, except for a maiden $25,000 claimer. Author Donna Barton Brothers autographed books in the clubhouse. Saratoga’s Santa Claus was dressed in the disguise of a guest services guide. Caption: Donna Barton Brothers signs copies of her book Iniside Track. 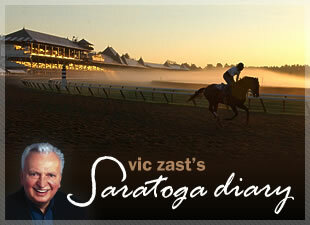 Vic Zast is the author of “The History and Art of 25 Travers.” He’s been to the races in Saratoga for 48 straight summers.